I was born in Warwick, Rhode Island, but I spent most of my formative years in Springfield, Massachusetts. My painting career began when, at the age of fourteen, I took an adult watercolor class at the George Walter Vincent Smith Art Museum in Springfield in the summer of 1969 - the same summer as the first moon landing. My grandmother bought me all the materials required for the class. Without her support and encouragement, I might never have become a painter. I painted quite a lot as a teenager, then not at all for a number of years. Around 1980, I began painting again, developing a fairly substantial body of work over the next couple of years, much of which was purchased by collectors. Within a few years, newly married with a new home and financial responsibilities, painting time was squeezed out. In 2007, more mature and established in my life, I found I missed the creative outlet that painting had previously provided me. I pulled out my old easel, my brushes (some of which I've had since I took my first watercolor class, many years ago), and my paints and paper. I have painted steadily since. I have been fortunate to be able to make my living in creative pursuits throughout my life. But, most of my creativity has been channeled into realizing other people’s visions. Having reawakened the painter in me, I have committed myself to a pursuit of my own vision. 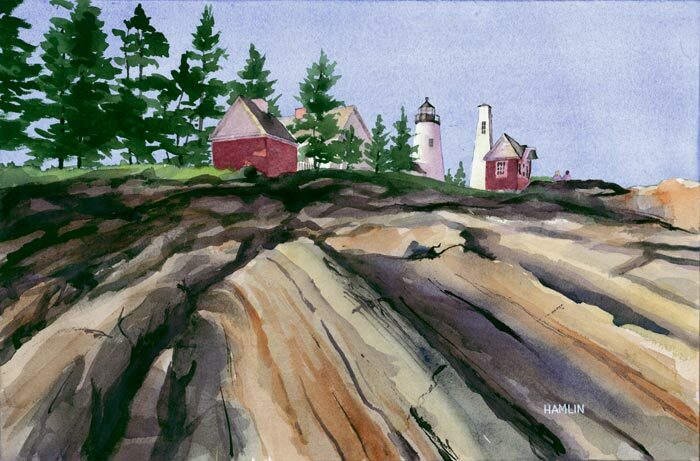 My subject matter reflects three life-long passions: nature, history, and architecture. I have lived most of my life in New England, and I derive tremendous satisfaction from capturing images of my home region and from the travel that my wife, Linda and I enjoy doing together. In our daily lives, as well as our travels, Linda and I strive to capture the beauty and wonder that surrounds us, she as a photographer, and I through my paintings. I paint strictly in watercolor, in a style that lies somewhere between impressionistic and photo-realistic. I aim for an accurate representation of my subject, building each painting on a foundation of careful draftsmanship. I develop my paintings with a steady succession of washes, bold brush work and glazes, followed by more precise calligraphic strokes, while allowing my medium the freedom to impart its own vibrant flavor to the work. I love the transparency and immediacy of watercolors and celebrate the happy accidents of the medium, as well as its challenges. Other than the one class I took many years ago, I am self-taught. I count Winslow Homer and Arthur Guptill among my many influences. My dear aunt, Frances Avery – an oil painter in Charlemont, MA - was a childhood inspiration and has continued to encourage me in adulthood. I have also been fortunate to meet many fine contemporary painters who have helped to shape my painting career. Above all, I rely on my wife Linda, whose support, advice, and constructive criticism strengthen every painting.